Rochester International Airport in Rochester, NY is the closest airport to the east side of the Finger Lakes (about 45 minutes - 1 hour driving time). Hancock International Airport in Syracuse, NY is the closest to the west side of the Finger Lakes (about 1-1 ½ hours drive time). You will need a vehicle to explore and enjoy the Finger Lakes area, and we recommend you rent a car at the airport. 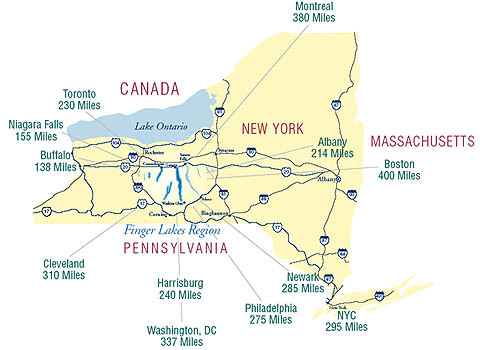 The Finger Lakes Region is within a day's drive of most major metropolitan areas in the northeastern U.S. and eastern Canada. It is easily accessible via the New York State Thruway (I-90), I-81, or I-86 (old Route 17). We also have two convenient Finger Lakes rental office locations for check-in to your Finger Lakes vacation home. Route 81 North to NY 17 West. Take Exit 52 towards Watkins Glen/Route 14 North. Continue through Watkins Glen, turn onto ramp for Route 14A North towards Penn Yan. Continue into Penn Yan, our office is the blue house on the corner next to the Best Western Hotel. Follow New York State Thruway West to Geneva, Exit 42. Travel south on Route 14 through Geneva and continue to Route 54, which will bring you into the village of Penn Yan. Follow the signs and stay on Route 54, to the intersection of Route 54 and Route 14A. We're on the southeast corner of the intersection in the blue house next to the Best Western Hotel. Follow the New York State Thruway East to Canandaigua, Exit 44. Take Route 332 South to Routes 5&20 East. Follow Routes 5&20 about 7 miles until you reach Route 14A South. Follow Route 14A South into Penn Yan. Continue through the Village until you reach the intersection of Routes 14A & Route 54. Our office is on the southeast corner of the intersection in the blue house next to the Best Western Hotel. At Exit 44, follow Route 332 South into Canandaigua to the intersection of Routes 5 & 20 and Route 332. Continue straight through the intersection towards the lake, and stay left at the fork. Our office is located on the left side of the road just before Scoops Ice Cream, across from Kershaw Park. Turn left at the intersection of Routes 5 & 20 and Routes 332. Keep left at the fork and continue along the lake. Our office is located on the left side of the road just before Scoops Ice Cream, across from Kershaw Park. Turn right at the intersection of Routes 5 & 20 and Route 332. Stay left at the fork and continue along the lake. Our office is located on the left side of the road just before Scoops Ice Cream, across from Kershaw Park.